When I first found out about the world of wrapping, the mythical wrap of legend that was sought after by nearly every wrapper was the UppyMama handwoven. Woven in Alberta, Canada, these wraps are handwoven by a small group of artists who have dedicated their passion to educating families about the benefits of babywearing to both the parents and baby. At my very first babywearing meet-up through our local group, a mama brought her UppyMama wrap that she had been lucky to win a draw to purchase through UppyMama at retail. That's right, these things were (and are) so popular that they cannot keep up with demand and you must enter for a chance to buy one. Though the market value has come down substantially due to the introduction of a whole slew of amazing new weavers to the handwoven scene, these still often sell at or above retail price on the swaps. At the time I received my first UppyMama these beauties were selling second hand for nearly double the retail price. I was fortunate to win my first UppyMama in a Dip (a whole other topic - basically a raffle). I was so excited, and drove to pick it up the same day the Dip closed. 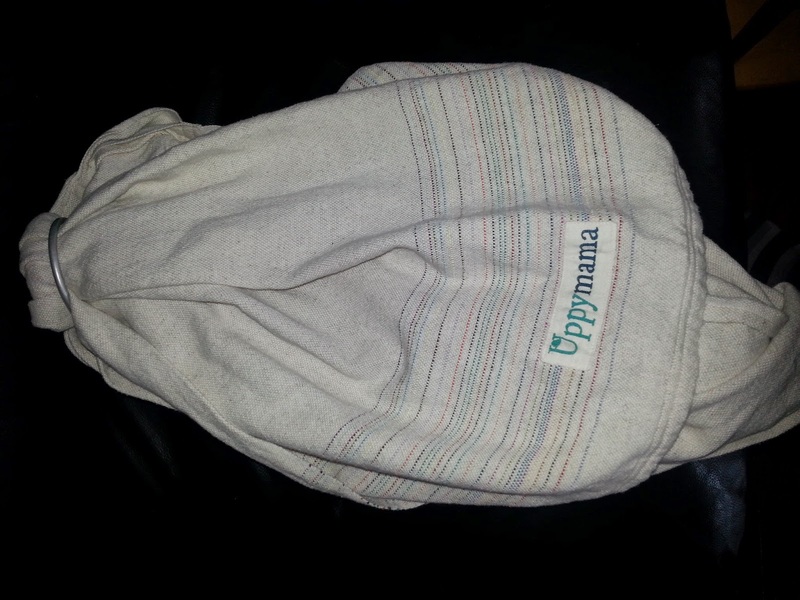 I won a UppyMama Frosted Rainbow Cake 20% linen blend ring sling with an original UppyMama floating shoulder. This ring sling was made from un-dyed cotton and linen, with a rainbow of pinstripes added on the tail only. When I picked it up, I could not believe how soft this piece of cloth was. As I've mentioned several times, I don't generally like linen. This linen was like nothing I had ever felt, you could not even tell there was linen in the blend by touching it. 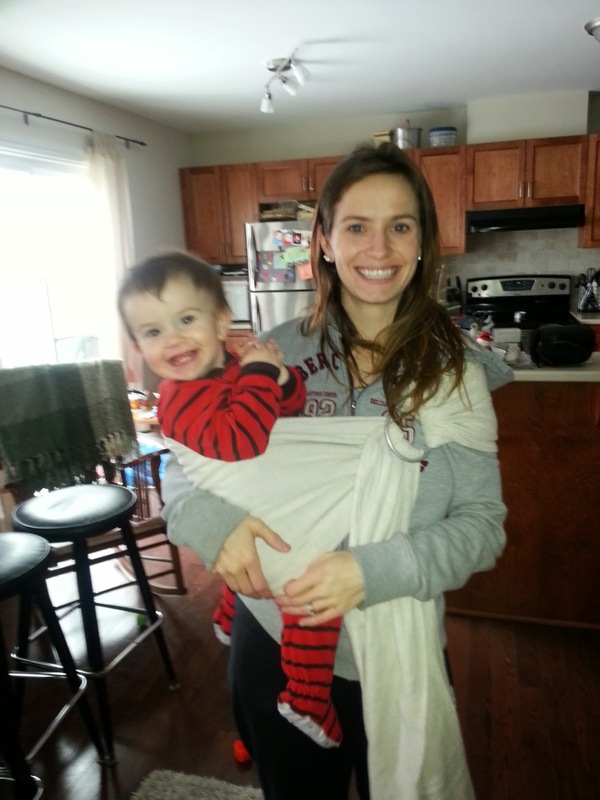 I wore my 24lb son in it right away, and could not believe how supportive and comfortable this was. The floating shoulder kept the fabric nicely spread, and the linen added the perfect support to this amazingly soft and thin fabric. We began using this as our main ring sling, wearing it through Church services and while shopping with baby happily napping for up to an hour at a time in nothing but comfort. This ring sling remains in my collection to this day, and it still the most comfortable ring sling I have ever tried. Cons: Expensive (though prices have come down substantially), some colourways are hard to find. Recommendation: If you are looking for a luxurious, Canadian, handwoven masterpiece (and money is no object) that you can wear your baby in, this is your ring sling.